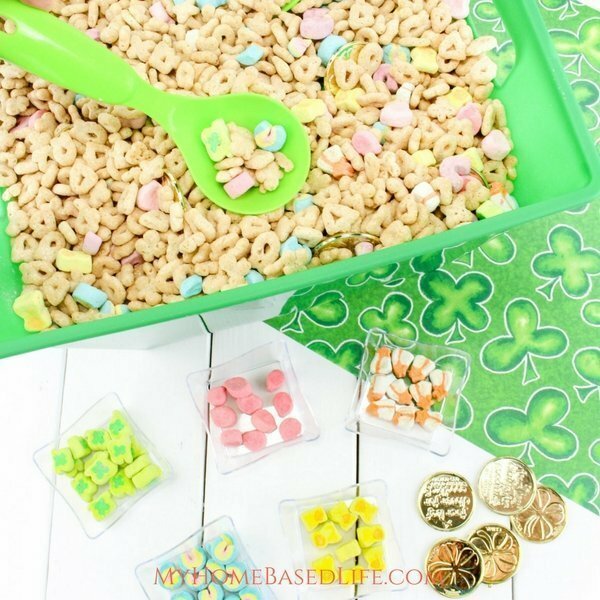 This Lucky Charms Sensory Bin for kids is so much fun and edible too! It literally takes mere minutes to put together for what could potentially be hours of fun for little hands. My 10-year-old loves this as well so it isn’t just for ‘little’ kids. If you need another idea for little kids I have a great Learning Letters Bottle cap game. It helped SO much with my youngest. 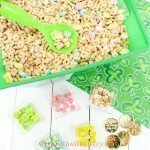 The Lucky Charms Sensory Bin is a great way to teach sorting and fine motor skills with the tongs or ‘pinchers’ as my kids call them. They can help with finger placement and grip for when they start holding pencils. Pour the box of cereal into your container or bowl. 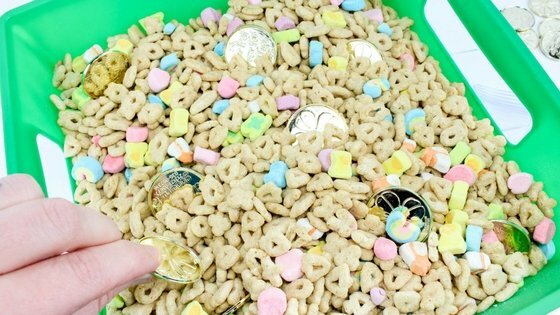 Bury all the gold coins throughout the cereal. 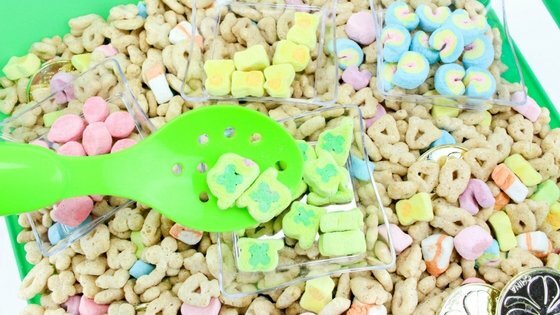 Have your child start sorting the marshmallows into each cup using their scoop or tongs according to their colors/shapes. They’ll be excited to find gold coins as they dig for the marshmallows. 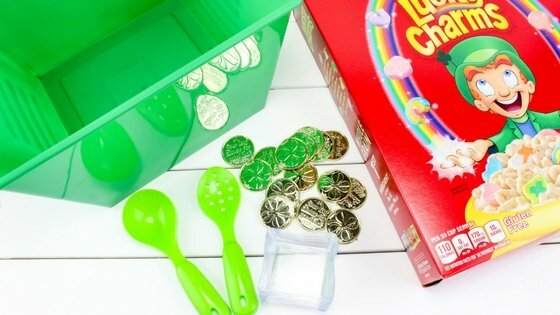 A fun way to learn color, shapes, and sorting! What Seek and find sensory bins do you make for your kids? 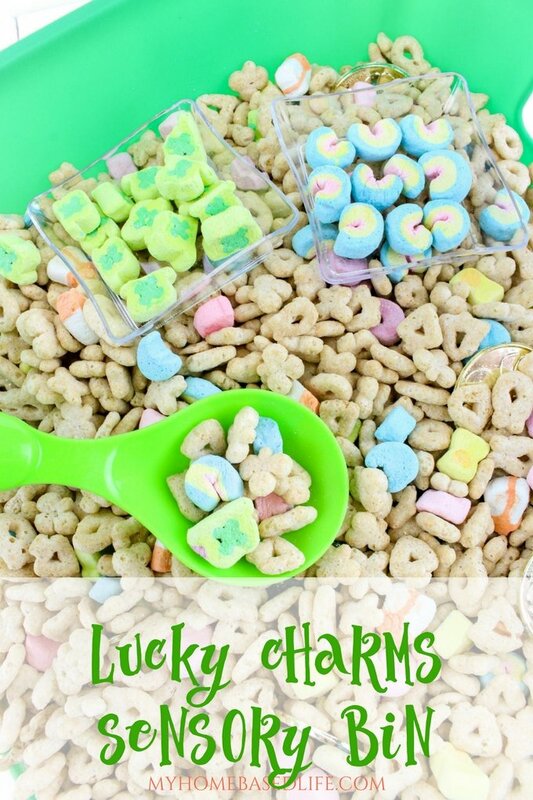 Have your child start sorting the marshmallows into each cup according to their colors/shapes. They’ll be excited to find gold coins as they dig for the marshmallows. This is such a fun idea! I want to try this with my kiddos. We’ve been talking about leprechauns and gold coins a lot this weekend so this is perfect timing! What a fun game for kids to play. I can already see them go all excited about these awesome coins. Great idea! Goodness. This is one of those, why didn’t I think of that posts! I love this idea. So easy!!! How fun! My 5 and 3 yr old would absolutely love this. My daughter is particularly into sorting. We are supposed to get rain all week, so it will probably be needed! I think my child would just eat them rather than sort them, lol! It is a great idea though! This is such a fun and creative idea! My kiddos would love it! This is a great idea. I think is pretty fun too. I am pretty sure kids wouldn’t mind doing some sorting and a little snacking, lol. The tongs are such a great idea! I love festive learning activities – definitely helps gets the kids excited! 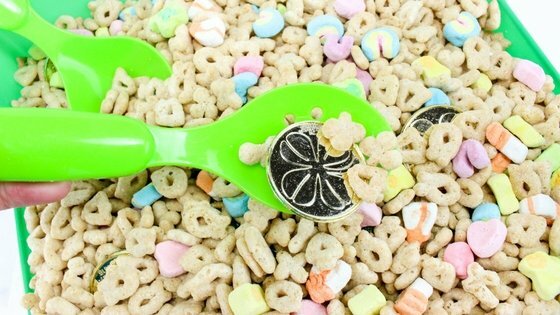 This sounds fun to find items/treasures in the lucky charms cereal. Great idea to get some learning out of the activity as well by sorting the marshmallows.